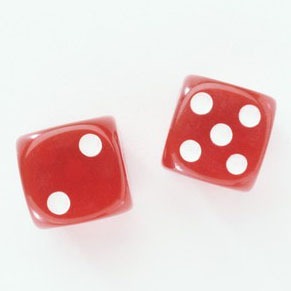 A die (plural dice, from French dé, from Latin datum "something which is given or played") is a small throwable object with multiple resting positions, used for generating random numbers. 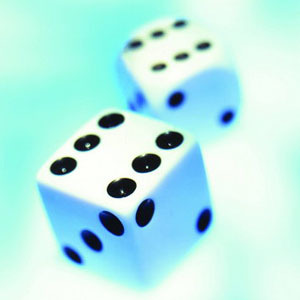 This makes dice suitable as gambling devices for games like craps, or for use in non-gambling tabletop games. An example of a traditional die is a rounded cube, with each of its six faces showing a different number of (pips) from 1 to 6. When thrown or rolled, the die comes to rest showing on its upper surface a random integer from one to six, each value being equally likely. A variety of similar devices are also described as dice; such specialized dice may have polyhedral or irregular shapes and may have faces marked with symbols instead of numbers. They may be used to produce results other than one through six. 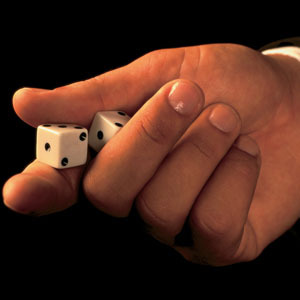 Loaded and crooked dice are designed to favor some results over others for purposes of cheating or amusement.